Cenarth Fox has 50 years of playwriting experience, and his plays have been staged in 50 countries. 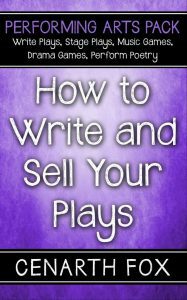 His 44K word book is packed with ideas, tips, and practical advice on getting started, choosing a genre, creating great plots and characters, writing dialogue which propels your play, understanding clangers and how to avoid them, being good at re-writing and editing, formatting your script, and importantly, how to get it performed. You need very little equipment. A player with some brief musical selections although live music is obviously ideal. Some flash cards and blindfolds will come in handy. And that’s just about it. Add enthusiasm and you’re away. The games are fun, great for school camps and the games allow you to introduce all sorts of musical skills and concepts. You can use the games in your classroom at any time. Great for rehearsals as a warm-up for your latest musical. Goes really well with Drama Skits ‘n Tips. Available as a printed book and as an eBook from Fox Plays. Available as an eBook from Amazon. 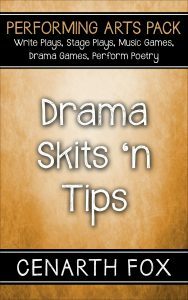 Drama Skits ‘n Tips is a 7K word little gold mine. 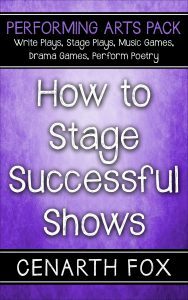 It’s full of drama activities for your class or rehearsal room. There are warm-up activities for the body and voice and many fun and challenging drama games to develop memory, language, expression and a passion for drama. And there are three, free short plays – a radio play, a puppet play and a mini play. As with Play It Again, Ham you need few props for Drama Skits ” Tips. The activities are terrific for the classroom, for school camps or as warm-up activities before your rehearsals. Add some fun to your show rehearsals. 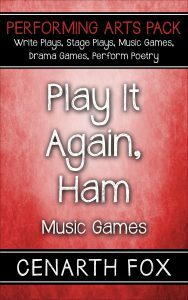 Drama Skits ‘n Tips and Play It Again, Ham are a perfect double act! Poetry can be fun. Poetry can be performed. 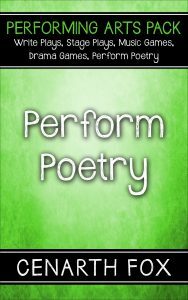 Perform Poetry has 16 poems which involve comedy and drama. The poems are spoken and, at the same time, acted. Loads of comedy too. There are helpful notes on getting started and on using each poem. Some themes are singing frogs, Halloween, dentists, accents, siblings, queues, limericks, tongue twisters and rock bands. There are suggested different ways to perform each poem. The poems introduce a terrific range of words and give your performers a simple way to participate in mime. You can add music. The poems make great concert items – short ‘n sweet and are ideal for classroom activities and fun items at camps or award-presentation nights. It’s a drama activity meets a literature lesson and the result is fun and more fun. Here are short samples of some of the poems. And boy could he sing. With muscles like that, he’s a hero. No wonder his I.Q, is zero.